i know this is late news but i have to say that i was stunned the way antonio margarito was beaten senseless by shane mosley. before the fight, i would have bet all my savings on margarito to dismantle mosley. lucky for me, i did not bet anything, but the tijuana tornado is not as lucky as he was stopped by mosley in the ninth round of their bout recently. 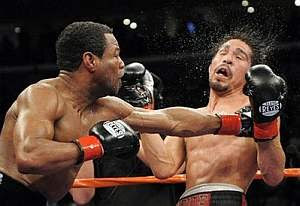 everybody knows that mosley is fast, margarito has a granite chin and can overcome any fighter with volumes of punches. but i guess not many thought mosley had the power to destroy that granite chin of margarito. i for one believed that mosley's age would put him at a disadvantage although margarito is not that young. mosley beating margarito is not the only stunning news to come out of that bout. i'm sure you have already heard about that "suspicious substance" found on margarito's hand wraps. mosley's trainer, nazzim richardson reportedly noticed that the hand wraps were a bit thick and requested it to be removed and margarito's hand re-taped. removing the hand wraps showed the suspicious material some belive to be plaster of paris. as a result, margarito's license has been suspended while investigation is being carried on by the california state athletic commission. if (and i hope not), the commission finds out that the margarito camp were cheating, it could put a lot of question on how margarito knocked out miguel cotto last year. it would also put the rematch between the two in jeopardy as the suspension could be lentghened.